So: the victorious Americans signed a peace treaty with Britain, designed a Great Seal of the United States (above), inaugurated John Hanson as the first president of the United States (under the Articles of Confederation)—and then peered into the sobering future of Independence. Can we maintain our hard-won freedom? Can we reconcile with the Loyalists? Can we unify our thirteen states into a sovereign nation, worthy of global respect? What image should we promote among Europeans? What values and traits should we herald as American? What IS an American, now that we are independent? Daunting challenges. Each section presents primary resources, introductory notes, classroom discussion questions, and supplemental links. 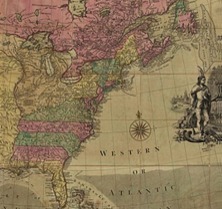 Block Image: Carington Bowles, Bowles's new map of North America and the West Indies, exhibiting the British Empire therein with the limits and boundaries of the United States as also the dominions possessed in that quarter, by the Spaniards, the French & other European states, the whole compiled from the best surveys and authentic memoirs which have appeared to the present year, 1783 (detail), London, 1783. Library of Congress, Geography & Map Division, Call No. G3300 1783 .B6 Vault. Courtesy of the Library of Congress.